Nancy (Younkin) Sanner was born in about 1829 near Kingwood, Turkeyfoot Township, Somerset County, PA, the daughter of "Yankee John" and Nancy (Hartzell) Younkin. Her husband was a wounded veteran of the Civil War. 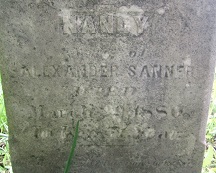 Nancy married fellow Somerset County native Alexander Sanner (1822-1905), son of Ludwig and Catherine (Lint) Sanner. Born on Sept. 6, 1822, he stood five feet, 8 inches tall, with blue eyes, brown hair and a fair complexion. They first lived in Elm (today's Normalville), Springfield Township, Fayette County, circa 1850. Later their residence was in or around Elliottsville -- sometimes known as "Elliott's Mills" -- in the mountains east of Uniontown, Fayette County. They had a dozen known children, born over a 23-year time-span between 1849 and 1876 – John "Franklin" Sanner, Matilda Catherine "Kate" Raymond, Eleanor C. "Ellen" McCann, Charles F. Sanner, Sarah Sanner, William J. Sanner, Marcellus Andrew Sanner, Ulysses "Grant" Sanner, Elliott Sanner, Alexander Sanner, Jacob Sanner and Isaiah Sanner. During the Civil War, Alexander agreed to be a substitute for George Kern. He served with the 62nd Pennsylvania Infantry, Company A. At the age of 41, he enlisted on July 16, 1863, with the rank of private. In October of that year, he was sick and absent from the regiment, being treated in Harewood Hospital in near Washington, DC. He remained hospitalized until at least December. At that battle, in combat, Alexander's right arm was struck by a gunshot, with an enemy minié ball which entered his hand and exited above the elbow. He was rushed to Judiciary Square Hospital in Washington, where the shattered limb was amputated about 2.5 inches above the elbow. Within a few days, he was sent to McDougal U.S. Hospital in New York, and then in June to Philadelphia to the U.S. Hospital located at 24th and South Streets. The army eventually transferred him into the 155th Pennsylvania Infantry, Company F, in September 1864. On Oct. 4, 1864, considered a "straggler," he was relocated to a nearby hospital at Broad and Cherry Streets, where he convalesced for the duration of the war. After the surrender of the Confederate army, he was moved again in May 1865 to the U.S. Hospital in Chester, PA. He received his honorable discharge on July 18, 1865. Immediately after the war Alexander returned home to his wife and then-seven children in Normalville. Within a month, he filed for and began receiving a military pension as compensation. Unable to write his own name, he signed the application with an "X," and received assistance with paperwork from the Protective War Claim Agency of the U.S. Sanitary Commission. The federal census enumeration of 1870 shows the family living in Fayette Springs, Wharton Township, with Alexander farming and son John, age 21, working as a common laborer. Nancy's sister and brother in law, Syvilla and John K. Rush, lived less than a mile away along what today is Wharton Furnace Road. When the Fayette County Atlas was produced in 1872, their farms were shown on the hand-colored map of Wharton Township, shown here. Nancy and Alexander's farm circled in blue, near Farmington, PA, south of the farm of Nancy's sister Syvilla Rush (circled in red), from the 1872 Fayette County Atlas. Below, Nancy's brief death notice in the Uniontown Genius of Liberty, April 1, 1880. Nancy died at the age of 51 on March 29, 1880. A brief obituary in the Uniontown Genius of Liberty said her passing occurred "suddenly" and gave the incorrect date of March 13. She was laid to rest in the small Van Sickle Cemetery near Elliottsville. An upright stone marks the grave today. It is legible, but the poem under her name and dates is almost illegible. Because she died so relatively young, many of Nancy's 25-plus grandchildren were born after the fact and not only never knew her but also had no idea what her name was. When asked for her maiden name many years later, several wrote "unknown." Alexander survived his wife by a quarter of a century. The 1880 census shows him living in Wharton Township with four of the younger children as well as married daughter Kate Raymond and her three children. By 1885, he drew a monthly pension payment of $30. As he aged, Alexander not only suffered from the loss of his arm and atrophied stump but also endured natural disabilities of old age. He tried to wear a prosthetic arm, but it was not comfortable. Among his ailments were asthma and irregular heartbeat, as well as a shrunken right breast area. Friend George W. Browner, who had known Alexander since childhood, remembered him before the war as "a stout hearty young man and now he is quite a wreck haveing lost his right arm which seems to affect his whole side." He advised the U.S. Pension Bureau that he was totally unfit for manual labor. In about 1890, he moved from his home into a residence in the county seat of Uniontown. Surgeons who examined him as a pension requirement noted in 1892 that his weight was just 125 lbs. At the time his pension payment had increased to $36 monthly. His address was Connellsville Street, Uniontown. 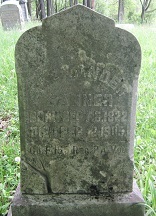 He died in Uniontown at the age of 82 on Feb. 12, 1905. After funeral services in his home, the remains were transported up over the mountains to the family grave plot in Van Sickle Cemetery south of Farmington, where his wife had proceeded some 25 years earlier. Nancy and Alexander were included in several printed genealogy studies published over the years. Among these are The Sanner Family in the United States, by Wilmer Mackey Sanner (1968) and Sanders Saga, Century Enterprises Genealogical Services (1971). In 2013, this webpage biography was researched and written, and the following Memorial Day weekend, their graves were photographed by the founder of this website. Small Van Sickle Cemetery near Farmington, PA, where the Sanner graves remain upright, as photographed May 2014. Son John "Franklin" Sanner (1849-1913) was born on March (or May) 6, 1849. He was christened in the Sanner Church in Somerset County on Christmas Day 1849. At the age of 21, in 1870, he lived at home with his parents in Wharton Township, Fayette County, and made a living as a common laborer. He married Seraphina "Sarah" Romesburg (1843- ? ) and they had six known children, Fuller Ellsworth Sanner, Alex Wilbert Sanner, Margaret Crossland, Nancy Pearl Maust, Walter Sanner and Roy R. Sanner. On April 1, 1913, living at 45 Downer Street in Uniontown, Franklin was afflicted with a stroke of paralysis. He died two days later on April 3, 1913, at the age of 63 years, 10 months and 27 days. Interment was in Park Place Cemetery. Son Fuller, providing details for the death certificate, gave the father's name as "Aleck" Sanner and the mother's maiden name as "unknown." Son Fuller Ellsworth Sanner (1874-1937) was born in 1874. He married Annie E. Crossland (1874-1945), daughter of Elijah and Nancy Crossland. The nuptials were held on Dec. 13, 1900, with Rev. T.F. Pershing officiating. Both were age 26 at the time. Fuller was a farmer. They are buried in Oak Grove Cemetery in Uniontown. Daughter Margaret Sanner (1877-1968) was born in 1877. She married William Crossland ( ? -1962). They had three children, outliving two: Elijah Crossland, Ellen Skeoch and Frances Crossland. Son Elijah is believed to have died in 1906. The Crosslands were members of the Trinity United Presbyterian Church in Uniontown. Their home in 1945 was on West National Pike near Uniontown. Further agony enveloped the Crosslands on Feb. 16, 1951, when married daughter Ellen Skeoch died in Reading, PA. William passed away on Feb. 5, 1962. Margaret outlived him by five years. She went to reside in the Laurel Rest Home during her final years, and died there on Sept. 13, 1968. Burial was in Oak Grove Cemetery, following a funeral service led by Dr. Vincent T. Ross. Their daughter Frances never married and worked for four decades for the G.C. Murphy Store in Uniontown. She died on July 14, 1976, just 10 days after our nation's bicentennial, with burial in Oak Grove. Son Walter Sanner ( ? - ? ) lived in Uniontown in the mid-1940s. Daughter Nancy Pearl Sanner (1883-1940) was born in 1883. She married Chauncey Maust (1880- ? ), a native of Virginia and the son of Noah and Sarah Maust of Wharton Township. The ceremony was held on Christmas Eve 1905 at the residence of Rev. M.J. Weller. At the time, the 25-year-old Chauncey worked as a teamster while 22-year-old Nancy was a housekeeper. They had two daughters -- Margaret Haggerty and Ethel Whiteman. They resided in Evans Manor, Uniontown, and Nancy was a member of the Oliver Methodist Church and lodge of the Women's Benefit Association of the Macabees. Nancy died of "complications" at home at the age of 57 on Oct. 10, 1940, reported the Uniontown Morning Herald. She was laid to rest in Sylvan Heights Cemetery following a funeral conducted by Dr. James C. Clark of the Second Presbyterian Church. Grandson John Sanner married Mary Brehm, daughter of Clyde G. Brehm of Wilkes-Barre, in December 1931. Granddaughter Margaret Sanner wed Lt. Keil G. Holland in May 1944. Grandson Harold Sanner lived in Kensington, MD circa 1961 and married Helen Grove. Son Roy W. Sanner (1886-1935) was born in 1886. He married Myrtle N. (?) (1892-1938). Their children were Roy W. Sanner Jr., Ruth Sanner, Helen Sanner, Walter Sanner, Evelyn Sanner, Donald Sanner and Dale Sanner. Heartache rocked this family in February 1936 when married son Roy Jr., of Downer Avenue in Uniontown, died of meningitis at the age of 21. Because of the threat that the disease would spread, the family was placed in quarantine, and daughter Helen had to take leave of her position with Bell Telephone until the risk passed. Roy passed away on Dec. 10, 1935 at the age of 49. Interment was in Sylvan Heights Cemetery. Myrtle only survived her husband by three years. She died in 1938. Daughter Matilda Catherine "Kate" Sanner (1853-1900) was born in 1853. She married carpenter Samuel P. Raymond (1851-1936). Their six known children were Blanche Romesburg, Gertrude Snyder, Della Hunt, Olive Raymond, Nancy "Nannie" Williams and Charles G. Raymond. In 1880, Kate and her three daughters lived under her father's roof in Wharton Township, while Samuel was away, presumably for his work, and quite possibly out of state in West Virginia. Later, they rejoined as a family and were members for 45 years of the Asbury Methodist Episcopal Church. Sadly, Kate passed away in about 1900, at the age of 47. The cause is not known. Samuel survived her by a remarkable 36 years. He was considered "one of the better known and well beloved older residents of the Hatfield schoolhouse road," said the Uniontown Morning Herald. Samuel died at the age of 85 at the home of his daughter Blanche Romesburg in Uniontown. Following a funeral at the Romesburg home, led by Rev. W.M. Douglass of the First Methodist Protestant Church, he was laid to rest in the Oak Grove Cemetery. At the time of death, reported the Morning Herald, he was survived by 31 grandchildren and 31 great-grandchildren. Daughter Anna "Blanche" Raymond (1875-1966) was born in about 1875. She married Alex G. Romesburg ( ? -1965). They lived in Uniontown and had seven known children -- Dr. S. Harold Romesburg, Ruth Gladden, Martha Rhodes, Mary Ellen Collins, Raymond Romesburg, Wilson S. Romesburg and Alex A. Romesburg. They were longtime members of the Great Bethel Baptist Church of Uniontown, and Blanche regularly attended the Keystone Sunday School Class. Sadly, their son Harold died in 1933. Alex passed away in 1965. Blanche survived him by one year. She died on Feb. 11, 1966, in Uniontown Hospital. Burial was in Oak Grove Cemetery. The Uniontown Morning Herald noted in an obituary that she was survived by seven grandchildren and three great-grandchildren. Grandson Dr. S. Harold Romesburg ( ? -1933) obtained his degree in dentistry from the University of Pittsburgh in 1924. He established his practice in Uniontown's Fayette Title and Trust Building and was considered "one of the city's best known members of the profession." On April 18, 1933, he eloped to Wellsburg, WV with Martha Elizabeth Roth, daughter of Steven J. Roth of Middletown, CT. She was a graduate of the Middletown Business School and worked as an assistant in her husband's office. News of their wedding, published in the Morning Herald, said it was "a complete surprise to friends of both bride and bridegroom." But heartache ensued later that year when Harold died an untimely and unexpected death. Details are being researched. Granddaughter Ruth Romesburg married William D. Gladden and lived in Grove City, PA.
Granddaughter Martha Romesburg wed (?) Rhodes. Her home in 1966 was in Canton, OH. Granddaughter Mary Ellen Romesburg married Melvin Collins. They dwelled in Uniontown. Grandson Raymond Romesburg resided in Uniontown. Grandson Wilson S. Romesburg lived in Uniontown. Grandson Alex A. Romesburg made his home in Greensboro, PA. Daughter Della Raymond (1877-1949) was born in about 1877. She married Thomas Hunt Sr. and they had three children -- Samuel Hunt, Raymond Hunt, Frances Swan, Ruth Monty and Mrs. Willys B. Black. They were members of the Great Bethel Baptist Church of Uniontown, and Della belonged to its Keystone Sunday School class and Ladies Aid Society. Their home was at 11 Elwood Avenue. At the age of 72, Della died on April 21, 1949. Funeral arrangements were handled by the Minerd Funeral Home, with services at the family church, led by Dr. Carey S. Osborne. An obituary was published in the Uniontown Morning Herald. Granddaughter Frances Hunt married (?) Swan. She lived at her parents' home in 1949. Granddaughter Ruth E. Hunt wed (?) Monty. In 1949, they resided in Detroit. Granddaughter (?) Hunt married Willys Black and lived in Waltersburg, near Uniontown. Daughter Nancy E. "Nannie" Raymond (1879- ? ) was born in 1879 in West Virginia. She married Louis C. Williams (1876- ? ) , son of John T. and Caroline Williams of Luzerne County. They were wed on Jan. 10, 1900, when she was age 21 and he 24. Rev. J.C. Broomfield officiated in the ceremony held in Pittsburgh. At the time of marriage, he earned a living as a laborer. Son Charles G. Raymond (1880-1965) was born in 1880 in Fayette County. On Oct. 13, 1898, he married his first wife, Bessie C. Williams (1880- ? ), daughter of John T. and Caroline Williams. The couple was wedded in matrimony by Rev. E.J. Wilson on Oct. 13, 1898, when both were age 18. Charles worked as a laborer at the time. They had six children -- Caroline Haddon, Mrs. Ray Carlson, Mrs. Clara Caruso, Charles G. Raymond Jr., Harry A. Raymond and Lewis A. Raymond. Charles was a longtime carpenter and member of the Christ Methodist Church, belonging to its Leland Bible Class. After the death of his first wife, he married again, to Ida Bowden, and lived at 7 Veech Street. Charles died at age 83 on Jan. 5, 1964. Burial was in Oak Grove Cemetery following funeral services led by Rev. O.G. Shindledecker and Rev. J.W. Shell. The Uniontown Morning Herald noted that his survivors included 19 grandchildren and 30 great-grandchildren. Granddaughter Caroline Raymond married (?) Haddon and lived in Washington, DC. Granddaughter (?) Raymond wed Ray Carlson. Their home in 1964 was in Chautauqua, NY. Granddaughter Clara Raymond married (?) Caruso and lived in Connellsville. Grandson Charles G. Raymond Jr. resided in Washington, DC. Grandson Harry A. Raymond made his home in Elizabethtown, PA.
Grandson Lewis A. Raymond died young. Daughter Blanche Gertrude Raymond (1883- ? ) was born in 1883 in Pennsylvania. At the age of 24, she married 23-year-old teamster Ivy C. Snyder (1884- ? ). The ceremony was held on June 4, 1907, with Rev. J.S. Bromley officiating. Ivy was the son of Oliver and Martha Snyder and had been born in West Virginia. Daughter Olive Raymond ( ? -1931) never married. She made her home with her widowed father for many years on Connellsville Street. She died in May 1931, with her funeral preached by Rev. H.H. Will of St. Paul's Lutheran Church. Burial was in Oak Grove Cemetery. Daughter Eleanor C. "Ellen" Sanner (1854-1939) was born on Aug. 27, 1854. She married Charles Wesley McCann ( ? -1924). They lived at 21 Iowa Street in Uniontown and were members of the Third Presbyterian Church. Their six children were Anna Belle McCann, Mrs. R.P. Burnsworth, Mrs. Floyd M. Seaman, Charles A. McCann, Walter S. McCann and Olive Wonders. Ellen was "a devout member of the third Presbyterian church and was endeared to all who knew her," said the Uniontown Morning Herald. She was active in the congregation's Sunday School and Ladies Missionary Society. Ellen survived her husband by 15 years, and lost two of her adult daughters. She died on June 24, 1939. The funeral was led by Rev. Clarence W. Kerr of the family's church. She was laid to rest in Oak Grove Cemetery, with arrangements handled by the Minerd Funeral Home. The Morning Herald confirmed that her parents were "Alexander and Nancy Younkin Sanner," and listed her pallbearers: Judge J.W. Dawson, Springer Rockwell, Ira B. Coldren, W.B. Jacobs, N.E. Garwood and J.J. Newcomer. She was survived by eight grandchildren and nine great-grandchildren. Daughter Olive McCann ( ? -1921) married Dr. Homer F. Wonders. They resided in Philadelphia. She died on March 20, 1921. Daughter Anna Belle McCann ( ? -1926) lived at home with her parents. She suffered from heart disease, and died from its effects on April 27, 1926. Her obituary was printed in the Uniontown Morning Herald. Rev. E.A. Hodil officiated at her funeral, followed by interment in Oak Grove Cemetery. Daughter (?) McCann wed Floyd M. Seaman and lived in Uniontown. Daughter (?) McCann married R.P. Burnsworth and made her home in Uniontown. Son Charles A. McCann resided in Uniontown circa 1939. Son Charles F. Sanner (1856-1931) was born on Oct. 16, 1856 in Somerset County. He married Laura F. Conway (or "Conaway") (1863-1946), the daughter of Morgan and Mary (Sherer) Conway of Maryland. They had five children: Jessie Gleason, Helen McCartney, Dalton Charles Sanner, Mary Eddy and Josephine Chisnell. He lived in Wharton Township in 1905 and was a longtime farmer. By 1931, he had retired and had moved into the city of Uniontown, making his residence at 43 Oakland Avenue. Suffering from heart disease, Charles died at home on March 24, 1931, at the age of 74. Interment was in the Oak Grove Cemetery. His obituary was published in the Uniontown Morning Herald. Son Dalton provided key details for the official Pennsylvania certificate of death. Laura lived for another 15 years and made her residence near Farmington. She passed into eternity on Nov. 8, 1946. Daughter Mary Sanner ( ? - ? ) was born in (?). She married Earl L. Eddy. Circa 1933, they lived in Republic, Fayette County. By 1943, they had relocated to Warren, Trumbull County, OH. Daughter Helen Sanner (1891-1951) was born on July 13, 1891. She married John S. McCartney (1890-1943), the son of William R. and Catherine (Switzer) McCartney of Farmington. The couple lived on Morgantown Street in Uniontown, Fayette County (perhaps temporarily) and at 208 East End Avenue in Beaver, Beaver County, PA. They had four daughters -- Katherine Supler, Helen "Lucille" Supler, Margaret Luther and Mary Frances Brown. John was a construction foreman with Dravo Construction Company. Sadly, while in Beaver in late February 1943, John was stricken with double pneumonia and was rushed to Rochester General Hospital. He died there just a few days later at the age of 52 on Feb. 27, 1943. His remains were returned to Fayette County for interment in Sansom Chapel Cemetery. As a widow, Helen resided part time Beaver for good to be near her daughters, while maintaining her primary residence at 26 South Mt. Vernon Avenue in Uniontown. Suffering from hypertension and hardening of the arteries, she died in Rochester Hospital at the age of 59 on Feb. 6, 1951. She joined her husband in eternal repose in the Sansom cemetery. Granddaughter Kathryn McCartney (1911-2006) was born on Sept. 19, 1911 in Farmington. She married Floyd W. Supler and lived in Beaver in 1943. They had at least one daughter, Margaret "Peggy" Snyder. In 1954, they lived on Seventh Street in Beaver. That year, daughter Peggy was chosen as Regatta Queen of the Beaver Valley Boat Club and was pictured on the front page of the Beaver Valley Times (June 22, 1954). Kathryn was employed by Beaver Trust Bank in the bookkeeping department and was a member of the Methodist Church. Later, she relocated to Fairless Hills, PA, to be nearer to her married daughter and family. In 2003, she relocated with the Snyders to Surprise, AZ. She died in Surprise at the age of 95 on Oct. 11, 2006. Granddaughter Helen "Lucille" McCartney was employed in early adulthood as a secretary in Lafayette Junior High School in Uniontown. She wed John B. Supler ( ? - ? ) of Waynesburg, Greene County, PA. They were wed on Oct. 3, 1934. The couple resided in 1943 in Beaver. By 1951, she had relocated to Gary, IN. Later in life she returned to Beaver. Granddaughter Margaret McCartney married Marnie Luther and made her home in Uniontown. In 2006, here home was in Hopwood, on the outskirts of Uniontown. Granddaughter Mary Frances McCartney wed (?) Brown and lived in Uniontown. She married again to (?) DeCarlo. Daughter Josephine Sanner (1886-1962) was born on March 3, 1886 in South Union Township. She married fellow school teacher George Chisnell (1883-1953), a native of Pittsburgh and the son of George and Sarah (Mills) Chisnell. The couple lived in Farmington, Fayette County. She was a longtime educator, teaching school for three decades in Wharton Township. She also was a member of the Bethel Church of the Brethren and the Ladies Aid Society. George passed away at the age of 69 on April 16, 1953. Josephine outlived him by nine years. Afflicted with cervical cancer, Josephine died in Wharton at the age of 74 on March 30, 1962. Interment was in Bethel Cemetery, following funeral services led by Rev. Donald F. Fornwall and Rev. Dr. Earl P. Confer. Charles L. Chisnell of Farmington signed her death certificate. Daughter Jessie G. Sanner ( ? -1943) was born in (?). She married Grover M. Gleason ( ? - ? ). They lived in the Uniontown area and were members of the Central Christian Church, where Jessie belonged to the Loyal Daughters Sunday School class. The couple had three daughters -- Dorothy Van Wickle, Jean Knight and Grace Davis. Jessie was "active in community affairs throughout her life here," said the Uniontown Morning Herald. Grover was employed by Motor Square Garage in Uniontown, a distributor for Pontiac and Oakland brands in the 1920s. Circa 1930, he was president of the Uniontown Automotive Association and was named show manage for the group's annual automotive exhibition. By 1939, he worked for Motor Sales & Services which dealt in Chrysler and Plymouth models. He also sold Acme trucks. Their home in the early 1940s was at 44 Highland Avenue in Uniontown. She was felled by a stroke and died at the age of 54 in Uniontown Hospital on April 15, 1943. Rev. Earl P. Confer officiated at her funeral, followed by burial in Sylvan Heights Cemetery. As a widower, Grover kept busy and in August 1962 served as president of the Gleason-Glass-Niner-Dice family reunion held at Wharton Furnace Union Chapel. Evelyn Dice assisted him as reunion secretary treasurer. Granddaughter Dorothy Gleason wed Clyde Robert Van Wickle Jr. Her home in 1943 was in Brentwood, south of Pittsburgh, and in 1972 in nearby Whitehall. They had one known son, Clyde "Robert" Van Wickle III. Sadness enveloped this family in September 1972 when their son Robert, who was married and lived in Marshall, TX, died at a young age. Granddaughter Jean Gleason married (?) Knight. She resided in Avalon, near Pittsburgh. Granddaughter Grace Gleason wed (?) Davis. In 1943, she lived in Homestead, Allegheny County, PA. Son Dalton Charles Sanner (1895-1973) was born in about 1895 in Farmington. He was married twice. His first bride was Lillian McCartney ( ? - ? ), also of Farmington. After her death, he wed E. Pearl (?). In all, he had four known children -- Betty Jean Sanner, Sarah Jane Baker, Carl D. Sanner and Mitchell W. Sanner. Dalton lived in Uniontown in 1943 and in Elyria, OH in 1946. While in Uniontown, he was a member of the Central Christian Church of Uniontown. He was employed by Bendix Westinghouse Corporation and retired from the company. His final years were spent on Butternut Ridge Road in Elyria, where he was a member of the First United Methodist Church of Elyria. Sadly, he outlived three of his four children. He died in Elyria Memorial Hospital at the age of 78 on April 12, 1973. His remains were returned to Uniontown for interment in Sylvan Heights Cemetery, with Rev. Dr. Earl P. Confer officiating and an obituary printed in the Uniontown Morning Herald. Granddaughter Sarah Jane Sanner (1924-1955) was born on Dec. 8, 1924. She married William Baker. Their home in 1946 was in Elyria, OH, and in 1955 was in Levittown, Bucks County, PA. They had one known daughter, Judith Ann Walls. Stricken with ulcers of the colon and heart problems at the age of 28, she underwent surgery in July 1953. She tried to recover for two years but died at the age of 30 on Aug. 2, 1955. Grandson Mitchell W. Sanner made his home in Norrisville, PA in 1973. Grandson Carl D. Sanner (1915-1937) was born on Nov. 14, 1915 in Republic. As a 21-year-old, he was employed as an automobile salesman and was considered "one of Uniontown's best known young men." Tragedy struck on Oct. 20, 1937, when he was killed in a head-on automobile collision along Route 88 near Brownsville, Fayette County. He sustained a ruptured bladder and other internal injuries after losign control of his vehicle while rounding a sharp curve. He died the same day. The Uniontown Morning Herald reported that Mabel Miller of Brownsville also was killed and that 23-year-old Hartford Rollins was in critical condition with a fractured skull. Daughter Sarah A. Sanner (1858-1924) was born on Dec. 4, 1858. She was unmarried at the age of 23, in 1880, and kept house for her widowed father. By 1891, she made her home in Confluence, Somerset County, PA.
On Oct. 27, 1891, at the age of 30, Sarah and 44-year-old Jacob "Springer" Johnson (1846-1935) united themselves in marriage. He was the son of Isaac and Rachel (Downer) Johnson, also of Confluence. Their marriage license application shows that neither had been married before. They did not reproduce, and resided at 43 Oakland Avenue in Uniontown, Fayette County. When she was age 65, Sarah fell and fractured her femur. She subsequently suffered a stroke of paralysis on Jan. 3, 1924, and died three weeks later, on Jan. 24, 1924. She was laid to rest in Oak Grove Cemetery. Her husband, providing details for her death certificate, advised that her father was "Alex Sanners" and that her mother's maiden name was "unknown." In an obituary, the Uniontown Morning Herald said her death was caused by "a complication of diseases." Springer survived her by a number of years. He died at home on Nov. 29, 1935, at the age of 89. An obituary in the Uniontown Morning Herald said he was "a member of one of the pioneer families of Uniontown" and died "from a complication of diseases incident to advanced age." The newspaper also noted that he was survived by his sisters Joanna L. Johnson, Mary Elizabeth Johnson and brother David D. Johnson as well as nephew George D. Johnson and niece Mrs. John D. Barnard. He was laid to rest in Uniontown's Oak Grove Cemetery following a funeral officiated by Rev. W.H. McKinney of the Central Christian Church. Son William J. Sanner (1859- ? ) was born in 1859. He resided in Uniontown, Fayette County, PA circa 1905. Son Marcellus Andrew Sanner (1862-1943) was born on Oct. 15, 1862 in Somerset County. He was a house carpenter and moved to Ohio as a young man, settling by 1890 in the town of Marlboro near Alliance, Stark County. Marcellus served in the U.S. Army, presumably during the Spanish-American War in the late 1890s. In about 1888, at the age of 26, he married 28-year-old Mayme Roudabush (1860-1936), daughter of Ben and Mary (Reichard) Roudabush of Hartville, OH. They had at least two children, Kathryn Sanner and Warren Sanner. Marcellus was listed as a house carpenter in the 1900 census and as a farmer in the 1910 census. In 1920, the census-taker recorded Marcellus' occupation as "farmer - truck farm." He was named in the Uniontown Morning Herald obituaries of his siblingsjjjj Grant in 1915, Charles in 1931 and Ellen McCann in 1939. 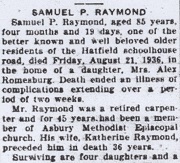 Sadly, enduring senility as well as cancer of the uterus and stomach, Mayme died in Marlboro on April 2, 1936, at the age of 75. Now widowed, Marcellus retired from farming in May 1941. He suffered from hardening of the arteries and heart disease for the final decade of his life. He died of a stroke on May 25, 1943, at the age of 80. He was laid to rest in Marlboro. The informant on his Ohio death certificate, Roy France of Alliance, did not know the names of Marcellus' parents, and they are marked as "unknown." Daughter Catherine Sanner (1891- ? ) was born in June 1891 in Ohio. Son Warren Sanner (1894-1977) was born on Jan. 12, 1894 in Ohio. At the age of 16, he lived at home and helped his parents with farming chores. He married Iva Lower (July 18, 1895-1989). They had at least one son, Warren E. Sanner. The Sanners migrated to California, where they spent the remainder of their lives. Warren passed away four days after christmas in 1977. Iva survived him by a dozen years and joined him in death on June 5, 1989. They rest in Oakhill Memorial Park. Grandson Warren E. Sanner (1930-1968) was born in 1930. He was joined in wedlock with Marylyn L. (?) (1930-2000). 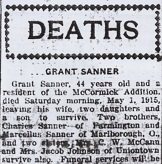 Son Ulysses "Grant" Sanner (1870-1915) was born on June 22, 1870, in Wharton Township, Fayette County, just five years after the end of the Civil War. He was his parents' first child born after the war and named for the famed Union Army general, Ulysses S. Grant, under whom his father had lost an arm in battle. At the age of 29, on Jan. 6, 1900, Grant wed 21-year-old Louise "Lula" Radtke (1879- ? ) of Wharton Township, and the daughter of Fred and Annie Radtke. They did not use a church minister, but instead united themselves in marriage. At the time, he was a laborer. They had three children -- Bertha M. Sanner, Marie Sanner and Arthur Sanner. The couple made their home in Uniontown. When the federal census was taken in 1910, they dwelled on Springer Avenue, but Grant had no occupation that year. In 1915, they lived in the McCormick Addition of the city. Grant made a living as a merchant. Grant became afflicted with tuberculosis of the lungs and the illness lingered for five years. He died from its effects at the age of 44 on May 1, 1915. 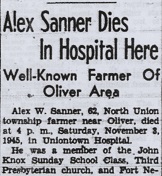 A brief obituary in the Uniontown Daily News Standard noted that the funeral was to be held at the Sanner home. Burial was in Oak Grove Cemetery. Nothing more about Louise is known. Daughter Bertha M. Sanner (1901- ? ) was born in 1901. Daughter Marie Sanner (1904- ? ) was born in 1904. Son Arthur Sanner (1908- ? ) was born in 1908. Son Elliott Sanner (1873- ? ) was born in 1873. Son Alexander Sanner Jr. (1876- ? ) was born in 1876. He died sometime before 1905, but his details are not known. Research for this page graciously shared by the late Olive (Rowan) Duff and the late Donna (Younkin) Logan. Obituaries courtesy of the Uniontown (PA) Public Library.